One of the greatest challenges in fighting cancer is cell targeting and biomarker selection. The Atypical Chemokine Receptor ACKR3/CXCR7 is expressed on many cancer cell types, including breast cancer and glioblastoma, and binds the endogenous ligands SDF1/CXCL12 and ITAC/CXCL11. A 20 amino acid region of the ACKR3/CXCR7 N-terminus was synthesized and targeted with the NEB PhD™-7 Phage Display Peptide Library. Twenty-nine phages were isolated and heptapeptide inserts sequenced; of these, 23 sequences were unique. A 3D molecular model was created for the ACKR3/CXCR7 N-terminus by mutating the corresponding region of the crystal structure of CXCR4 with bound SDF1/CXCL12. A ClustalW alignment was performed on each peptide sequence using the entire SDF1/CXCL12 sequence as the template. The 23-peptide sequences showed similarity to three distinct regions of the SDF1/CXCL12 molecule. A 3D molecular model was made for each of the phage peptide inserts to visually identify potential areas of steric interference of peptides that simulated CXCL12 regions not in contact with the receptor’s Nterminus. 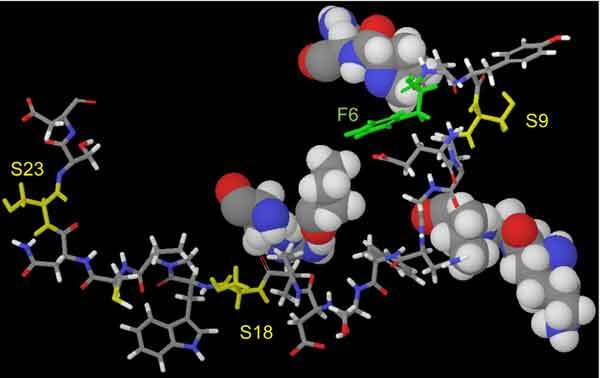 An ELISA analysis of the relative binding affinity between the peptides identified 9 peptides with statistically significant results. The candidate pool of 9 peptides was further reduced to 3 peptides based on their affinity for the targeted N-terminus region peptide versus no target peptide present or a scrambled negative control peptide. The results clearly show the Phage Display protocol can be used to target a synthesized region of the ACKR3/CXCR7 N-terminus. The 3 peptides chosen, P20, P3, and P9, will be the basis for further targeting studies. Atypical chemokine receptor, Glioblastoma, Phage Display, Targeted therapy. Department of Nanoscience, University of North Carolina at Greensboro (UNCG), Greensboro, North Carolina 27412, USA.